"The best astrocartography / astrology books"
For the last 30+ years I have helped people like you achieve their personal goals and beyond. Now you can find out what I know and how you too can enjoy success and happiness. My new ebooks reveal, for the first time ever, the secret techniques that have made me and my personal clients so fortunate and successful. Get started on your own journey to enjoy more happiness and accomplishment now! Download the first ebook of the series, Finding Paradise, absolutely free. You can download sample chapters of each ebook for your consideration and enjoyment before deciding to purchase the full edition of the ebook. Just click on the links below to find your own Paradise. Discover exactly where your own personal paradise is! This amazing free ebook explains how to pinpoint your unique "opportunity spots" both in your current location and anywhere else in the world. This hot new ebook details the process I use to guide my personal clients to achieve their maximum goals in life. Learn where to go to find the perfect opportunities, people and resources you need to achieve your dreams and ambitions. A must read for anyone seeking to enjoy life to the fullest extent possible. "I downloaded your "Finding Paradise" e-book and wanted to tell you how much I appreciate your work. It is so brilliant and makes so much sense. I decided to write you and congratulate you on all the great work you are contributing to this science and this art. Most therapists are always saying, "where ever you go, there you are," which actually discourages people from making "geographic" improvements. But having lived, worked and/or studied on 4 continents, I can attest that I was very different and my opportunities different in every place I went. So I'm all for moving when its the right thing to do. I'm grateful you have developed tools and techniques to ensure the best relocation choices for the best results." This mind-blowing ebook breaks all the (unnecessary) rules and pushes astrology into the 21st century. If you have ever disagreed with the standard astrology interpretations of your chart, you are not alone. Most people already realize that the classic reading of their natal chart or forecast doesn't fit them 100% perfectly at all. Download sample chapters of this revolutionary ebook absolutely free! 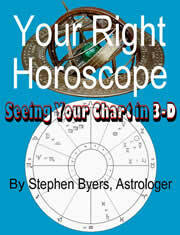 This brilliant ebook helps you finally understand yourself correctly and completely by introducing you to your chart in its true-to-life three-dimensional shape. Get ready for some BIG surprises when you first see your horoscope in 3-D. Luckily, you don't have to wear weird plastic glasses to see 3-D astrology. In this incredible ebook, I point out the missing elemental truths about astrology and life that everyone has forgotten to consider. Hold onto your chair when you read this shocking expose of our everyday ordinary reality--life. I detail the amazing interpretation, forecast and relocation techniques I discovered over the last 30 years of research and private client practice. This ebook is an Richter 10 earthquake. This nifty ebook helps you quickly judge the positive and negative consequences of relocating to anywhere on earth--concisely and accurately. This book describes the entire process of evaluating any planed move. Armed with the knowledge of all 120 combinations of meanings for planets, houses and signs you will be able to judge what life holds in your new location. Download sample chapters of this great ebook absolutely free! Learn "Where to achieve your goals"
In this fascinating ebook I grade each of your planets in each of the 12 possible new relocated natal chart (RNC) house positions. From Sun in RNC First House (1h) to Pluto in RNC Twelfth House (12h), all 120 possible planet-house combinations are precisely rated. The short and long-term effects of any relocation are further divided into six different areas of life, individually rated to further help you decide where Paradise is for you. These include job, love, family, home, health and overall. 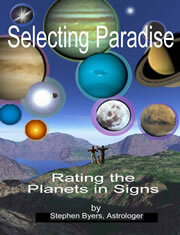 These 720 graded evaluations of your planets in the houses help you pinpoint your own ideal Paradise on earth. This is the companion ebook to "Picturing Paradise." 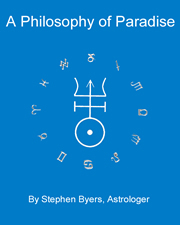 In this insightful ebook I rate the quality of your planets in the different signs (versus houses like "Picturing Paradise). This information is essential to finding Paradise (by relocating) and also to helping you choose the right moment to do any important action, such as getting married, applying for a job, buying a house, relocating, having an operation, investing money, etc. Download sample chapters of this exciting ebook absolutely free! Learn "When to achieve your goals"
In this ebook I grade each of your planets in each of the 12 possible signs. From Sun in Aries to Pluto in Pisces, all 120 possible planet-sign combinations are rated. The effects of any sign are further divided into six different areas of life, individually rated to further help you understand the what it means to you. These include job, love, family, home, health and overall. 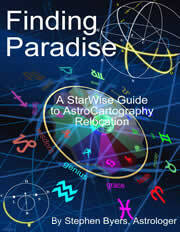 These 720 graded evaluations of your planets in the signs help you time your key activities in finding Paradise. 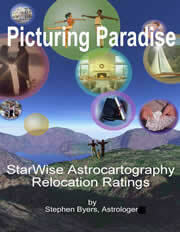 Order Picturing Paradise and Selecting Paradise at a special price. This is my own personal philosophy and approach to life. In this spiritual and irreverent ebook, I explain my not-so-secret tricks to finding and enjoying happiness and success--in a word, paradise. Download sample chapters of this tender yet humorous ebook absolutely free! Obviously, the benefits of your own StarWise service(s) may NOT be exactly identical to the testimonials above—you may enjoy more, less or similar results.